Kenny and crew are back. Racking up fees, fines and jail time. 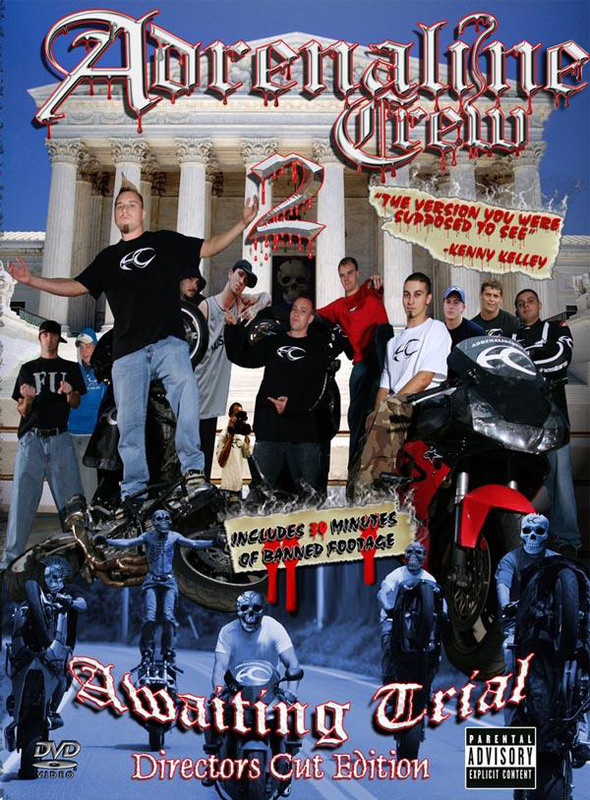 You will see the crew smash, flip, pillage, burn and utterly destroy themselves, their sport bikes and personal vehicles for your viewing pleasure! You saw Awaiting Trial? Well, now you can see the version you were supposed to see! Over 30 minutes of previously BANNED footage. Interactive Menu’s, over an hour of new bonus and deleted scenes. See the footage that was cut from “Awaiting Trial” for being too extreme. Adrenaline Crew has always been known for their crazy lifestyle, signature custom helmets and disregard for rules. This movie is no exceptions! Watch Kenny’s famous highway motorcycle wreck as he lands on his helmet (an adrenaline crew helmet) at 80 miles per hour and walks away with just a scratch! See Street Bike Tommy and Reckless Steve dual it out doing backflips and stunts. Also includes legendary tattoo artist Paul Booth as we let him tattoo one of our guys. Travis Pastrana also guest stars.